Background I am proud to say that I am a third generation teacher. 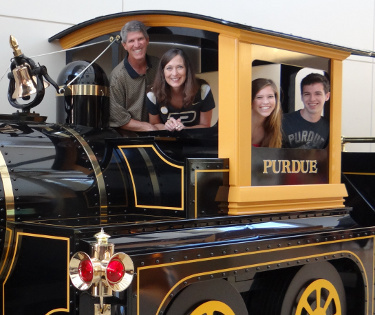 Having grown up in Indianapolis, I graduated from Purdue (Go Boilers) with a B.S. in Elementary Education and a minor in reading. I received my masters from Azusa Pacific in Azusa, California. I taught elementary school, 2nd 3rd, 4th, and 6th grade, for seven years in California. After staying home to raise my children, I was blessed to teach preschool and kindergarten. I opened Little Scholars Learning Academy in the Fall of 2010. Family I am very happily married and have two children. My oldest child, Andrew, attends Purdue University and is studying actuarial science and statistics. My daughter, Amanda, also attends Purdue and is majoring in marketing. I am the youngest of two children. My sister lives in South Carolina, but I am lucky to have my mom live nearby. I also have an Australian Shepherd named Louie. Hobbies I love to spend time with my family, friends, and Little Scholars. I also like to cook, travel, read, and spend time outdoors. I like to listen to contemporary Christian, jazz, classical, and country music. I love going to the opera! Trivia My grandmother taught geography to James Dean when he was in 7th grade in 1944.